In our "Safe machinery, step by step" series we present the individual measures needed en route to CE marking, one by one. 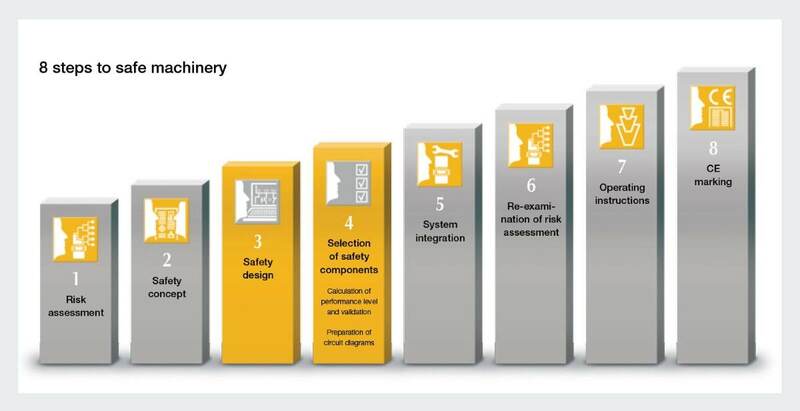 Following on from the issue of risk assessment and safety concept in Part One, here you'll find everything you need to know about the Safety design and selection of safety components. The aim of the safety design is to reduce or eliminate danger points through detailed planning of the necessary protective measures. This applies whether the machine is to be built from new, retrofit or converted. Specifically it concerns the design of mechanics, electrics, electronics, software and control systems, as well as the selection of components. In order to select the correct components it's necessary to define and verify the Performance Level (PLr) or Safety Integrity Level (SIL) that is to be achieved in accordance with EN ISO 13849-1 / EN IEC 62061. Appropriate calculation tools provide support with this complex procedure. Based on the safety-related characteristic values of the components, the PAScal Safety Calculator from Pilz validates the values that have actually been achieved, including the required/demanded default values PL or SIL. With the software-based tools you are guided step-by-step through the individual stages involved in the validation of safety functions. Continues … In Part 3 you can read all about system implementation and review.